Experts in the application of marine vinyl wraps for boats, jet skis, kayaks and more. So how do you make your boat look good? You could always get a marina paint job — it’ll just cost you a fortune and take a long time to be finished. You want a look that can withstand the low water temperatures in both fresh and saltwater that are normal for rivers, lakes, and oceans, and manage to maintain brilliant colors for years on end. After the old-fashioned paint jobs on other boats have faded in the sun, your boat will remain gorgeous when you partner with Evolve Graphic Solutions for a professional vinyl boat wrap. More than five years of experience means that we’ve become experts in the application of marine vinyl wraps for boats, jet skis, kayaks and more. Each installation utilizes state of the art equipment for the best results. 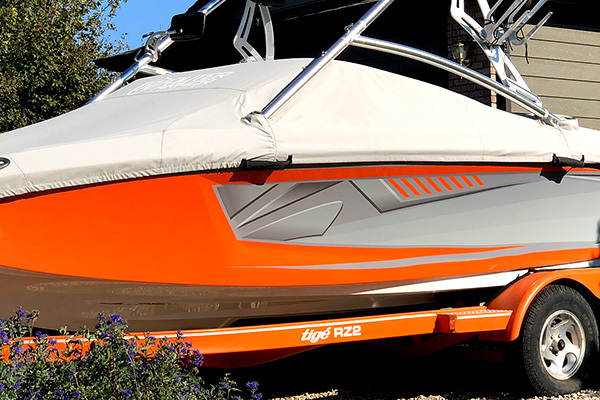 As a 3M Preferred graphics installer who only uses 3M knifeless tape, you can feel confident that your boat wrap will be seamless and look amazing. By insisting on using top-of-the-line hardware, we provide marine wraps that deliver only what you expect — visuals and colors that are guaranteed to turn heads. Ready to see what we can do for your boat or another marine craft with a professional boat wrap? We know, Colorado is a landlocked state. But that doesn’t mean that coastal states like California & Oregon should get to have all the fun when it comes to boating. We love our boats just as much, and we also know that when you’re out on the water, you want to make an impression as much as you want to enjoy the waves. Whether you want to wow the crowds this summer up at Horsetooth Reservoir outside of Fort Collins or are looking to advertise your company and products to folks on the water anywhere, Evolve Graphic Solutions is the best choice for quality work that will leave a lasting impression.